Two of the three main stage types used today were prominent throughout the classical world. 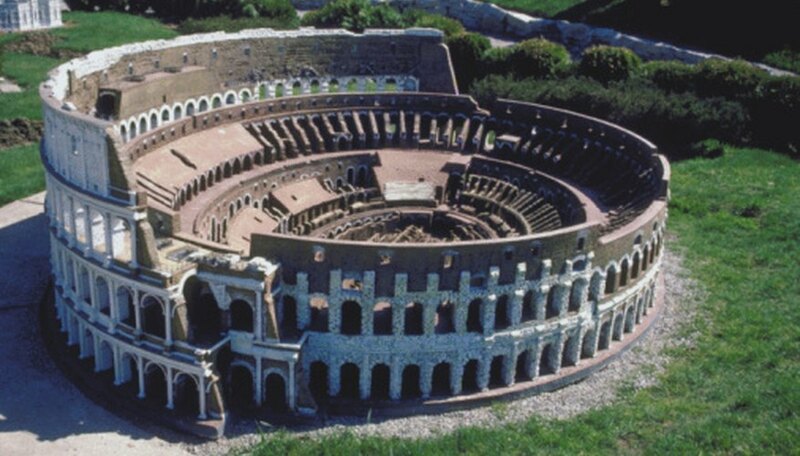 Rome's Coliseum, with its arena stage could seat 50,000 spectators for gladiator contests and other spectacles. The traditional Greek theater used a thrust stage with the audience surrounding the stage on three sides. In the past three centuries, plays and movies have been shown on proscenium arch stages, stages in which curtains above and on both sides of the stage provided a frame. Picture the Rose Bowl, Madison Square Garden, or nearly any professional team sport venue and you have an idea of an arena stage. In an arena, the stage is in the middle and the seating is around the event on all four sides. Arenas can be circular, as in the ancient Coliseum; square, as in Madison Square Gardens; or oval, as in the Rose Bowl. Arenas provide seating a maximum number of people to view an event and have been found useful for thousands of years for various sporting events. Hockey, football, basketball, baseball, skating and circus all use types of arenas to provide the largest amount of seating for their performance. Shakespeare built a thrust stage for his plays. In doing so, he copied the ancient Greek theater that had the stage thrust out into the audience. This creates a sense of intimacy between the actors and the audience, who are all essentially in the same room. At the Shakespeare theater in Ashland, Oregon, the spit projected from an actor's mouth during an impassioned speech can be clearly seen by those sitting in the first few rows. Barnaby Kay, a Royal Shakespearean actor said, "To perform on a thrust stage is an absolute thrill – you feel so connected to the audience, surrounded and supported during the performance. When the audience is no more than 15 meters away you feel like you are carrying them with you through the story, they are easier to draw in." Thrust stages are also used as the runway for fashion shows. If you've been to a movie theater or to school play, you've experienced a picture-frame or proscenium stage. Staging directions on the proscenium stages developed in renaissance Italy, where the back of the stage was elevated relative to the front of the stage to enhance the view for the audience. "Upstage" was near the back of the set and "downstage" was closer to the audience. Many proscenium stages have protruding "aprons" in front of the curtain where a small amount of the action may occur. The main advantage of this type of stage is that it has lots of space between the side curtains and behind the flat -- a canvas backdrop to the set -- for props, scenery and actors who were not involved in the current scene. These stages are also used for orchestral and operatic performances. The Oregon Shakespeare Festival outdoor theater is patterned as a replica of the Globe theater and has features of both the thrust stage and a proscenium stage. The main floor is the thrust stage while there are three openings on a second floor that can be closed off with a curtain or stay unlit until action occurs on them. The backstage is large, multi-storied and provides space for costuming and storage of sets, props and scenery for three or four plays at a time. Some modern theaters have more than one venue, each with its own type of stage, so the director can choose the type of stage to fit a particular type of play.